My name is Salome Mwangi. I live in Nyota location of Kuresoi North Sub County in Nakuru. I joined GROOTS Kenya through the Access to Markets project in January 2013, and was key in the formation of Nyota New Women’s Group. Before joining the project, I only used to plant potatoes on 1/4 acre of land that produced about 8 bags of potatoes with a bag selling for an average of Ksh.1000. After I received training on best farming practices, I increased my acreage under production to 1/2 an acre and borrowed Ksh. 20,000 from my group’s table banking to help me purchase seeds and prepare the land for planting. I got 20 bags of potatoes from the ½ acre and sold them at Ksh. 1200 each. Never in my lifetime had I held Ksh.20,000 in my hands, I could not believe the money belonged to me, but this made me realize how easy it was to make money from farming if only one would invest their energies on their farms. I replanted again on 1 acre in 2015 and got 40 bags of potatoes which I sold for a total of Ksh.40,000. In 2016, after I attended a learning visit to Baraka Agricultural Training Centre that was facilitated by GROOTS Kenya, and later received a basic need fund from GROOTS Kenya in the form of two bags of clean potato seeds (a type of certified seed variety), I planted these on 2 acres of land and harvested 100 bags per acre. I sold the potatoes for Ksh. 3,000 per bag and made Ksh. 600,000. 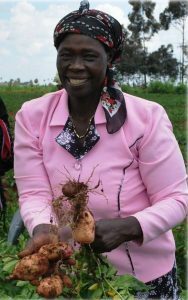 Later on in the same year, I planted clean potato seeds again on 3 acres of land and harvested 350 bags of potatoes which I sold for Ksh. 3000 per bag and made Ksh. 1,050,000. I used this money to purchase an acre of land and construction materials, I am now set to begin the construction of a permanent house. I entered into a contract with the Ministry of Agriculture to supply them with the Clean Seeds and I also sell the seeds to hundreds of women farmers within the project. I have been appointed to sit on the sub county potato board whose role is to speak on behalf of potato farmers in Kuresoi North Sub County. I am the chairlady of Nyota New Women’s group, and we have accumulated savings of Ksh, 1, 120, 000. Using the savings, we managed to purchase an acre of land in Nyota where we planted clean seeds. 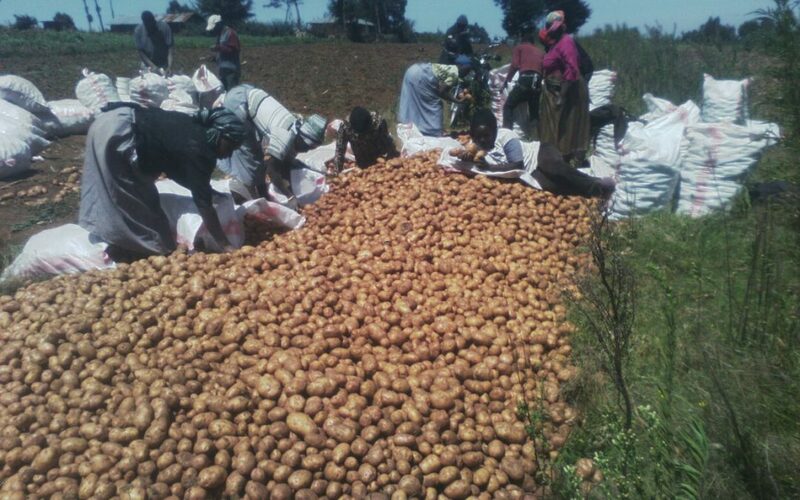 We harvested a total of 91 bags of potatoes and sold them among the group members for Ksh. 2,500 per bag. We put back this money back into the group account. I also received training as a horticulture coach and have been training women farmers in the project on potato farming and other best farming practices. In my community, several women have also adopted new farming technologies and have increased production levels. GROOTS Kenya has also fostered peace among us because people from different tribes now interact with one another and we see each other as sisters, and more women are now in leadership which means that men are beginning to appreciate the role of women in leadership. I am grateful for having joined GROOTS Kenya I thank them for intervening in my life and making me realize the opportunities I was under utilizing.